In the history of cinema, there's perhaps no other film that has been such an enormous, surprise hit on a global scale the way that Steven Spieblerg's 1982 classic E.T. The Extra-Terrestrial has been. After all, the seemingly unassuming, low budget tale of an alien who is accidentally abandoned on Earth, and his encounter with a boy that befriends him, doesn't necessarily conjure up the likes of a "whiz! bang!" action adventure, or convey a special effects laden bonanza. E.T. 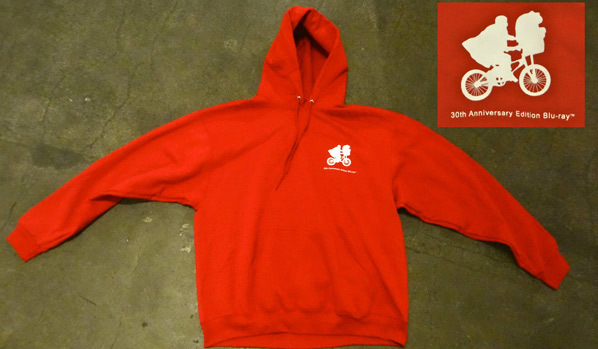 is hitting its 30th anniversary this year, and the Los Angeles Film Fest held a "bike-in" outdoor screening this weekend, complete with red hoodies. The summer of 1982, the time of E.T. 's original release, was poised to unleash an armada of high profile, high concept sci-fi and fantasy films in cinemas, all of which had a strong likelihood of pummeling past E.T. and leaving it in their wake. Arnold Schwarzenegger's first outing as Conan the Barbarian, Ridley Scott's Blade Runner, the crew of the Enterprise returning to face an old foe in Star Trek 2: The Wrath of Khan, John Carpenter's remake of The Thing, Disney's Tron, Mel Gibson's return as Mad Max in Road Warrior, and Jim Henson's epic fantasy The Dark Crystal -- were just a few of the films that vied for moviegoers attention and dollars in the short months of summer. When E.T. opened on June 11th in 1982, its spell was immediately cast upon moviegoers… many couldn't get enough of it, seeing multiple showings and telling their friends and family to see it. The key to the movie's success certainly was the incredible storytelling skills of Academy Award winning director Steven Spielberg, who'd awed audiences in recent years with films such as: Jaws, Close Encounters of the Third Kind, and the summer before E.T. with Raiders of the Lost Ark. Combined with the powerful and emotionally charged Academy Award winning score by constant collaborator, composer John Williams, and the work of the highly talented ensemble cast whose performances made you feel you were truly encountering and feeling exactly what their characters were, the movie soared with cinematic excellence. Special effects artist Carlo Rambaldi, who'd collaborated with Spielberg prior on CE3K in creating that film's aliens, and who also designed the head effects for the iconic, evil Alien creature for Ridley Scott, made history yet again with making E.T. one of cinema's most recognizable (and lovable) aliens ever. Deservedly, Rambaldi won Oscars for his work on both of these incredible yin and yang-like alien creations. E.T. has gone on to become one of the most successful films of all time — and even surpassed box office grosses of the original Star Wars at the time of its initial release. 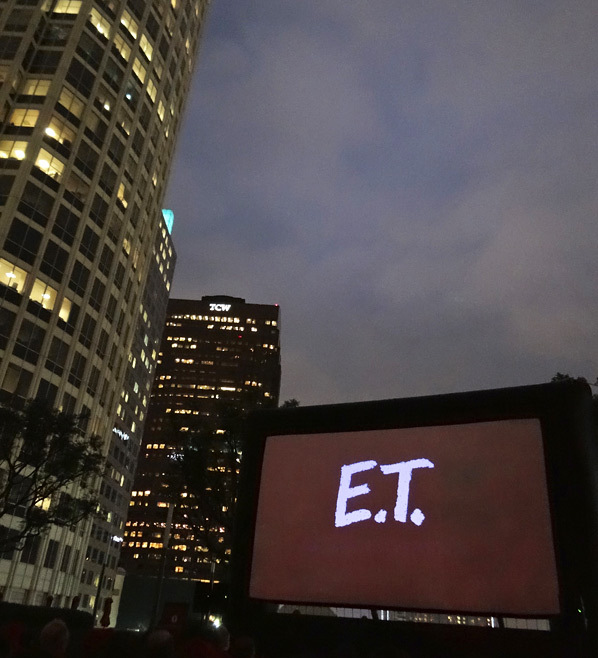 The LA Film Fest recently celebrated the 30th Anniversary of "E.T." 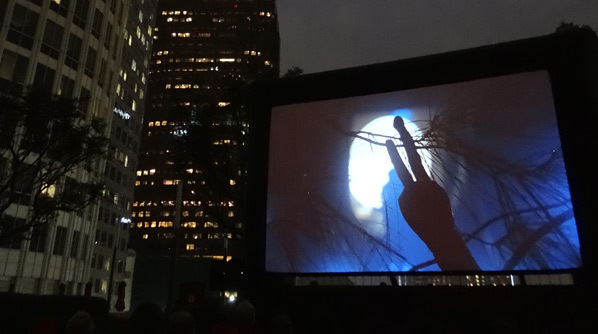 during a special, outdoor screening of the film in Downtown LA. The event drew hundreds of people, and many rode their bikes there in honor of one of the film's classic motifs. A DJ spun 80's music to create the vibe of the era, and everyone who attended received a red, Elliott style hoodie that bore the famous E.T. and Elliott on bike silhouette. At one point the audience pointed "E.T. style" to the sky for a photo opportunity — an ironic visual moment, as it also was clearly reminiscent to me of a scene from Spielberg's CE3K (seen @ 1:50 mark in here). The version of the movie they screened was thankfully the original, classic 1982 release version of the film — not the 2002 "special edition" version which contained controversial digital alterations (that were unwanted by many): most notably — walkie talkies that digitally replaced rifles during the famous police barricade sequence where E.T., Elliott, his brother and friends take flight on their bicycles, an alteration that's been repeatedly spoofed, perhaps most famously via the "South Park" TV show (you can see that episode here). This 30th anniversary screening also featured the new, vibrant transfer for the upcoming debut of the film on Blu-Ray that's set to be released this October. E.T's never looked better — with a crisp, highly detailed picture full of rich colors and dynamic contrast. 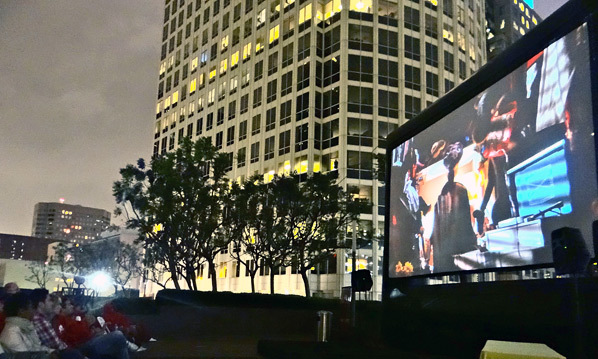 Viewing the film outside evoked the unique and fantastic drive-in days of yesteryear, coupled with the visually charged urban landscape of Downtown Los Angeles framing it all. The audience often cheered and laughed, some even cried — and all were clearly swept away by this timeless, modern day fairytale. Cool. Over here, on July 6th, a pair of souvenir shades will be given out to 10,000+ people—including me—who attend Movie Night in Chicago, watching "Blues Brothers" on the lawn at Wrigley Field. With Guinness World Record on hand to document: most people wearing sunglasses in the dark. Looking forward to seeing ET under the brooklyn bridge this summer as well. I can only hope they show the original and none of the re-edited/CGI nonsense! I can't tell you how happy I am that was the 1982 version (I have the DVD set from 2002 with both versions). Thank you, Steven Spielberg!